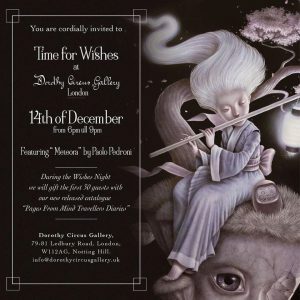 Please join us to celebrate pop surrealism, the holidays and a masterpiece which is an allegory of desire! We will be proud to present a special feature undisclosed masterpiece by Italian artist Paolo Pedroni titled “METEORA”. The artwork is a metaphor for desire and hope. Somewhere someone wished upon a star. Transcending the Daruma meditative state, the comet is shedding its pieces alluding to a celestial power in motion to turn this wish into reality. The cherry blossom, the symbol of the fragility of time, accompanies the ethereal comet during its journey. It shifts softly guided only by the harmonious flute and the gentle lantern light toward the gleaming galaxy, the center of an inextinguishable desire where everything is possible and imaginable. During the Wishes Night we will Gift the first 30 guests with our new released catalogue “Pages From Mind Travellers Diaries” featuring both exhibitions held in DCG London and DCG Rome. Catalogues will be given on a first come first served basis.